Taiwanese mobile phone maker HTC Corporation appears set to make its HTC One smartphone available in as many markets around the world as possible, and it has already partnered with China’s three major carriers for the release of the device in this country. The phone will be launched there as 802w on China Unicom (WCDMA), as 802t at China Mobile (TD-SCDMA), and with model number 802d at China Telecom (CDMA), as Engadget reports. 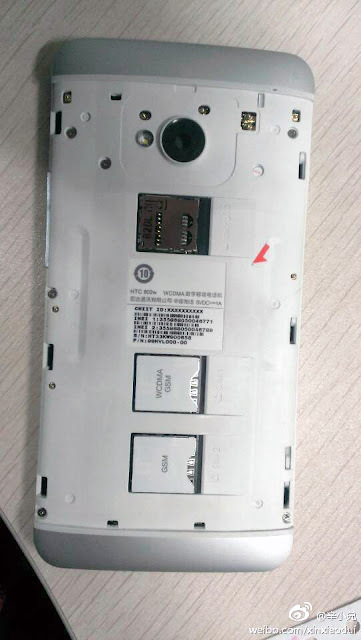 Furthermore, it seems that a photo with the HTC One 802w flavor has already emerged online, showing not only that the smartphone will pack a removable back cover, but also that it will include support for two SIM cards. The image comes from a Sina Weibo user, and also unveiled the phone’s microSD memory card slot, a feature that is missing from the European version of the device, it seems.